GAIN/FOREX.com has announced a new back-end trading service for all users on or after May 11th, 2018. You can read more about this service at FOREX.com. What is the impact for NinjaTrader users? 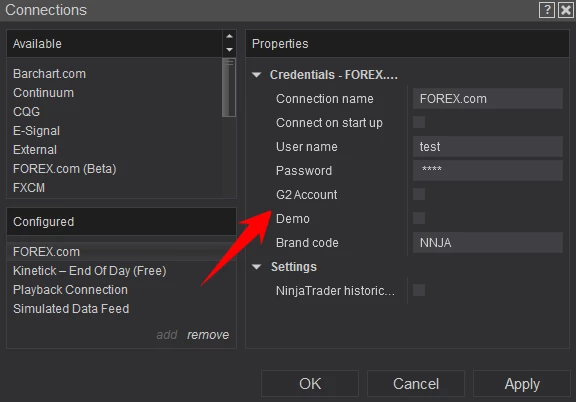 NinjaTrader had to write a new interface (currently in ‘Beta’ and ONLY available in NinjaTrader 8) to the new service, and all users must upgrade to NinjaTrader 8.0.13.1 or later on or after May 11th, 2018 to be able to trade their FOREX.com account. If you currently use NinjaTrader 7, check out the NinjaTrader 8 FAQ for details on migrating. If you currently use NinjaTrader 8, please ensure you have the 8.0.13.1 or later installed. You can check your currently installed version by going to the NinjaTrader Control Center, selecting the 'Help' menu and choosing the 'About' menu item. The latest version can be downloaded here. In the NinjaTrader 8 Control Center, find the "Connections" menu and select "configure". In the "Configured" section of the Connections dialog, select the already defined FOREX.com connection you use today. In the "Properties" section, locate the "G2 Account" checkbox and enable this property. You are now configured to connect to the new FOREX.com service. If you have general questions about the new service, please contact FOREX.com. If you need any support to properly configure NinjaTrader please contact us.